It may end a period in history for FIFA, but it will not be the end of FIFA. This Saturn transit happened before and FIFA survived it. Of course, any international big organization risks fraud and corruption, especially when large amounts of money and prestige are involved. This happens now that FIFIA President Sepp Blatter wants to be re-elected (it would be his 5th term) on Friday with transit Jupiter exactly square his Midheaven (and transit Pluto trine Midheaven). Jupiter+Pluto: that is a great combination when you want to win any contest. Transit Pluto is also trine his progressed Moon. I don't know what transits and progressions the other candidate has, but he 'd need a lot of fortunate aspects to conquer this. 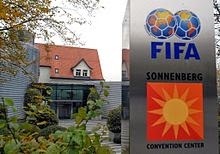 And...although Sepp Blatter is a Political Exposed Person (PEP) in Switzerland, were the 'raid' took place, and even though he is the 'CEO', he was not arrested. Whatever happens, Blatter seems to be immune (with the help of Sun square Jupiter and semi square Uranus perhaps). If the accusations are true, the fact is that he was in charge all the time and in a way this 'communicative busy bee and pilar of strength' (color horoscope Astro.com agan:) is formally responsible and the organization as a whole is to blame. Criticism comes with Saturn. Saturn hits FIFA's and Saturn hits the natal Moon of Blatter, too (transit Saturn semi square Moon). One of the interesting aspects between the charts of Blatter and FIFA is Pluto of FIFA square the natal Sun of Sepp Blatter. FIFA influences his life and life style and FIFA causes stress, too. I bet that it does, right now! Saturn-Moon transits makes you feel bad. But for how long? Transit Uranus will be conjunct the important Jupiter of FIFA soon and this aspect is the symbol of relief. Above is his chart with transits and progressions. And then you get a communication strategy that fits a politician and a die-hard in love and relationships. Plus financial management. Time will tell what happens next and if transits of Jupiter and Pluto help you win no matter what. WoW What A Astrology Blog site, Its Really Interesting, I Like it Always, ts Must Helpful For Human, Thanks Admin. Where did you get he hour (2:30 pm)? I'm thinking of analysing the FIFA's chart also. I have to study Fifa's chart (but not yet - I have another one that I must study first!). Thanks for sharing this great content. I love reading your posts. They are inspiring. I have some relevant information you can review below.